Global Security Company G4S deepens ties with Israeli apartheid. 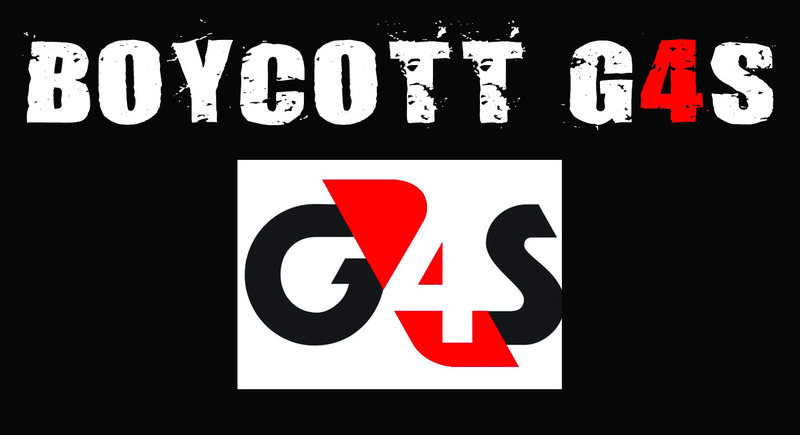 Boycott G4S! G4S, the world’s largest security company, is actively training Israeli police forces currently attacking Palestinians in Jerusalem. G4S, the world’s largest security company, is actively training Israeli police forces currently attacking Palestinians in Jerusalem. FST Biometrics, the company expected to supply the smart surveillance cameras that Israel plans to install at the doors of al-Aqsa Mosque (already installed at the Mughrabi Gate), is a partner of AMAG Technology, a company owned by G4S. Video evidence shows cars with the G4S logo supplying the security systems used by the Israeli government to restrict Palestinian access to the al-Aqsa mosque. At this critical time, the Palestinian BDS National Committee (BNC), the Palestinian leadership of the Boycott, Divestment and Sanctions (BDS) movement, welcomes the broad mobilizations around the world to hold G4S accountable for its ongoing violations of Palestinian human rights. Israel’s escalating repression, including the systematic attacks by Israeli police and private security firms on Palestinians and the al-Aqsa mosque compound in Jerusalem, heighten the urgent need to pressure G4S to end its complicity in Israel's violations of international law and Palestinians' human rights. The global BDS movement has already succeeded in pressuring G4S to end its deals with the Israeli prison service. We can't allow the corporation to continue its complicity with Israeli police forces and their repression of Palestinians. The launch in 2012 of an international campaign to boycott G4S put heavy grassroots pressure on the company to end its complicity with Israel’s violations of international law. Significant among G4S’s corporate interests in Israel were security contracts with Israeli prisons where Palestinian political prisoners are tortured, and supplying equipment and services to Israeli occupation checkpoints and illegal settlements built on stolen Palestinian land. In December 2016, G4S finally sold in full its Israeli affiliate, G4S Israel, to an Israeli equity fund called FIMI, along with the complicit contracts targeted by the BDS movement. At the same time, G4S reaffirmed its commitment to remain in the Israeli market. In the past few months it has become clear that G4S intends to remain deeply complicit with Israel’s regime of occupation, colonialism and apartheid despite the sale of its Israeli affiliate, which continues to trade under the “G4S Israel” name and uses the G4S logo. As confirmed by Who Profits, G4S holds 50% of Policity Ltd., the company contracted by the Israeli police to build and operate Israel’s National Police Academy, inaugurated in January 2015. Located in a 55-acre plot in Beit Shemesh, the National Police Academy combines all of Israel’s police training under one roof, replacing 20 facilities throughout the country. Policity, the company owned and operated by G4S, is responsible for at least 40% of the training instruction of Israeli police, amounting to about 40,000 hours in the current contract. The training provided by National Police Academy includes crowd control, house raids, interrogation techniques, target shooting and undercover operations — repression tactics aimed exclusively at Palestinians. With its ownership and operation of Israel’s National Police Academy and the training provided to Israeli police, G4S has deepened its involvement in Israel’s repression of Palestinians. The Israeli police plays a central role in advancing Israel’s illegal annexation of Palestinian East Jerusalem, with its well-documented track-record of daily attacks against Palestinians: the systematic demolition of Palestinian homes and expulsions of Palestinian residents from the city, the imprisonment of Palestinians without due process, torture and extra-judicial executions amounting to war crimes. The Israeli police also enforces the second-class status of Palestinian citizens of Israel through similarly violent tactics. In January 2017, Israeli police killed Yaakub Abu al-Qiyan during an early morning raid to destroy his village of Umm al-Hiran. The killing of al-Qiyan is consistent with the broad disregard for Palestinian lives by a sectarian Israeli police that sees Palestinians as an enemy, whether they are Palestinians living under military occupation in East Jerusalem or Palestinians holding Israeli citizenship. Furthermore, ‘G4S Israel’ has supplied the security systems used by the Israeli government to restrict free access to the al-Aqsa mosque. FST Biometrics, the company expected to supply smart surveillance cameras to be installed at the doors of al-Aqsa (already installed at the Mughrabi Gate), is a partner of AMAG Technology, a company owned by G4S. G4S’ disregard for international law and its direct involvement in gross violations of against Palestinians is in line with its longstanding attacks and abuse against indigenous peoples, immigrants, minorities, blacks and people of color in other countries. From the US to Palestine, from South Africa to the UK, G4S is deeply involved in the racist mass incarceration business and human rights abuses. Given the undeniable evidence of continuing and deeping G4S complicity with the violation of human rights of Palestinians, the Palestinian BDS National Committee (BNC) calls for an intensification of the Stop G4S campaign. Governments and public bodies to exclude G4S from public tenders, cancel existing contracts and not award the company new contracts, in conformity with third state obligations. This includes a call to UN and international governmental bodies to end contractual agreements with G4S and condemn the company’s activities in violation of human rights. Investment funds, churches, charities, trade unions and other shareholders to divest their holdings from G4S and implement ethical investment policies that would exclude from investment portfolios companies supporting Israel’s violations of international law and war crimes. Private companies to avoid awarding security contracts to G4S and end any existing contracts for alarm systems, security guards or other G4S services.